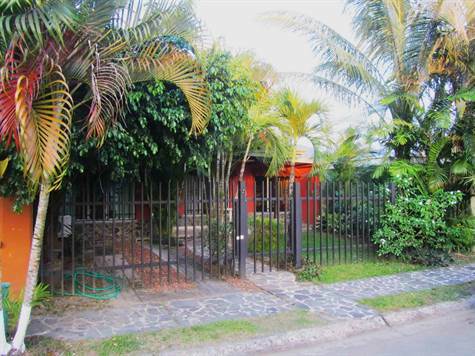 3 bedroom, 1.5 bathroom home ideally located in a family-friendly gated community just a two-minute walk to restaurants, shopping, and the beautiful crescent-shaped Jaco Bay Beach. Jaco is one of the most popular beach communities in Costa Rica, renowned for its restaurants, shopping and fun surf for all skill levels. This home is securely located in the middle of the Sol Dorado (Golden Sun) neighborhood with a carport and a walled/fenced front and back yard. Low H.O.A. fee of just $100 monthly covers security guards, landscaping in front yards, community pool, streets, sidewalks, parks and recreational areas including a kids' playground and basketball court for all ages. The main bathroom comes with a large bathtub which is rare in Costa Rica. The back yard is completely fenced with lush landscaping around the perimeter providing ample privacy. Ceramic tile floors and ceiling fans throughout.